So, a basic tomato sauce is one of the five mother sauces of French cooking. The mother sauces are called such, because they are the core, or start, to so many other sauces. And true to form, there’s dozens, if not hundreds of different directions you can take this sauce in by adding various meats, vegetables, herbs and spices. I find that the key to this recipe is in the sauté of the vegetables and the tomato paste. Tomatoes by nature are fairly acidic, and “light” in flavor. By letting the onions and carrots cook down you bring out their natural sweetness as a counter balance to the acid in the tomatoes. Then by sautéing the tomato paste to evaporate even more water out of an already concentrated product, you again develop some of the deeper, darker flavors, that will come through in the final sauce as a longer and more robust finish. Essentially everything at this point is in the sauce, and you’re just looking for the tomatoes to break down and the flavors to combine. 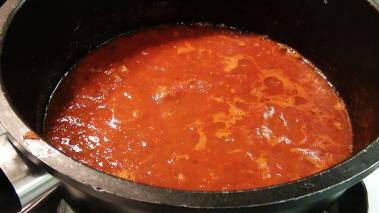 You can let the sauce cook for several hours, and it will get better over time. I generally like mine to go at least 2 hours from this point. The only thing you should have to do from here on out, is to check for seasoning and adjust the salt, pepper and maybe the sugar, as you go. I like the addition of the carrot (compared to other sauces I've made). Along with sugar (to offset acidic tomatoes) I added some butter.